This Waring compact toasting grill is a really great versatile piece of equipment to have in your kitchen. You can make anything from grilled cheeses to hamburgers to Cuban sandwiches which is what I’m going to show you how to make today. First, I’m going to place two slices of ham on my roll, then a slice of roast pork, two slices of Swiss cheese and two slices of dill pickle. Then, I’m going to put a little bit of yellow mustard on the half of my roll. Now, it’s time to toast these sandwiches. I’m using the Waring toasting grill with flat plates because I want the Cuban sandwiches to be nice and toasted on both sides and flattened a little bit. I’m just going to spray a little bit of Vegalene on the plates to prevent sticking and place these sandwiches on the grill; and these have nice heavy plates so I press down and I don’t need to sit and hold the top down. And, here you can see we have a beautifully and evenly toasted Cuban sandwich made with the Waring flat sandwich grill. If you’re interested in any of the items seen in this video, you can check them out in the links below. The Waring compact toaster grill is a great, versatile piece of equipment to have in your kitchen. Use this flat panini grill to make anything from grilled cheeses to hamburgers to Cuban sandwiches (which you'll learn to make in this video!). Vegalene All Purpose Spray Release's patented 3 oil blend formula makes it a top quality pan coating. This exclusive formula uses heat resistant lecithin to allow all foods to release easily from utensils and cooking surfaces. Foods don't stick and fall apart, providing more servable portions. This patented formula of canola, sunflower, and soybean oil is not diluted by water or alcohol and does not include any inorganic compounds. In fact, it features up to 30% more active release agents than other pan coatings for unparalleled performance and more efficient prep time. 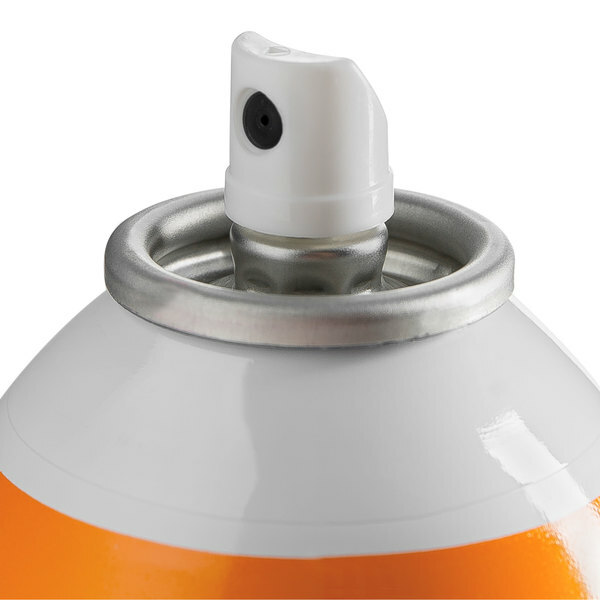 This easy-to-use aerosol can allows you to spray the desired amount on your cooking surface, so your foods will release easily. Not only can you avoid gummy build-up that occurs with other greases and oils, but you can also extend the life of your pans and lessen replacement pan costs. Eliminate labor time and avoid applying too much or too little grease with this spray that coats your surfaces consistently and evenly. It is suited for coating everything from frying pans, griddles, grills, and steam tables to casserole dishes, chafers, broilers, cookie sheets, and baking tins! The only nonstick spray we use on our cake pans. We've been using vegalene for years and I don't think we'd ever switch brands. The best! What a great, economical product! Perfect for hot pan frying. It has a very high smoke point, and is perfect when a non-stick pan isn't available. A great addition to our kitchen! This is a great all around spray. We use it for baking all the way to cooking. It is easy to use, no oily taste and no residue. Great value. The best spray there is for cupcake and cake pans. It doesn't leave greasy residue or an aftertaste, however, there are sprays that are made for that. Overall, wonderful gluten free product for baking! the gold standard of pan release sprays in pretty much every professional kitchen. it works well, it's easy to use and here on webstaurantstore its a solid price. i use it for baking and savory cooking and it works beautifully for both. 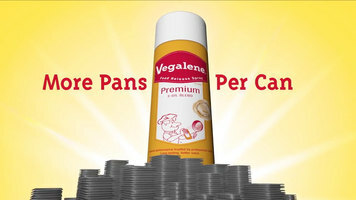 We purchased Vegalene as an all-purpose spray for out skillets and cast iron pans. It helps keep meats and other food products from sticking in the pan where grease / oil isn't needed. It doesn't have all the extra additives and preservatives and comes recommended. There are also flavored sprays available. Basic release spray. 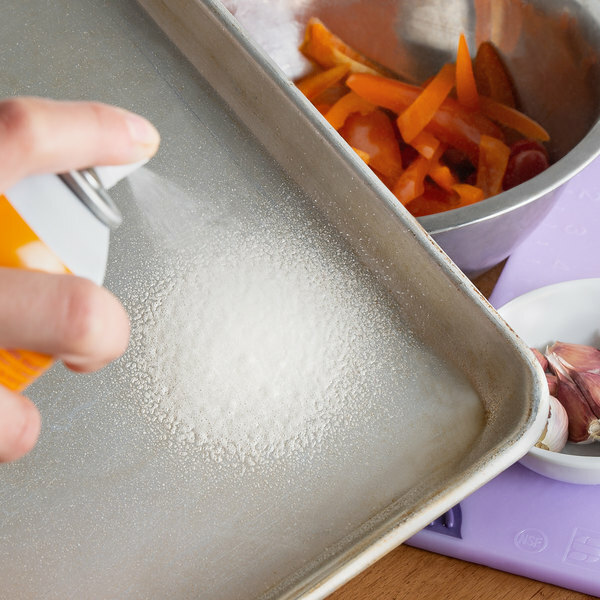 Spray it on a pan when you need to make sure your product will have an easy and quick release. Good product. Love this stuff works great ! Might cost a little more but I feel its worth it my kids who are learning to cook even noticed how much easier it is to clean the burnt eggs out of the pan after we had to switch to another brand because we ran out. The others work well but this brand is even better for those who care about additives and such. It works as well as the others too. I love this pan spray it makes clean up easy and getting food out I use this at home as well. I will not use any other pan spray its the best and the price is good as well. We like this for baking or our griddle tops. It actually lasts a lot longer than most conventional sprays and comes out a lot more dense. This stuff is by far the best release spray available, I use it for pretty much anything that needs nonstick applications. The price is the best too! I love this all purpose spray! Works great on grills and griddles! I will continue to order this product. Very impressed with the quality of the oil and taste. Nothing says non-stick like this bright orange can of Vegalene. Perfect for all your parchment paper and sheet tray uses. From alphabet cookies to zebra cakes, you're not going to stick with Vegalene. A good deal. works great. An inexpensive non stick spray. Leaves no taste from the product on the food. Good for all things baked, even works on our griddle. 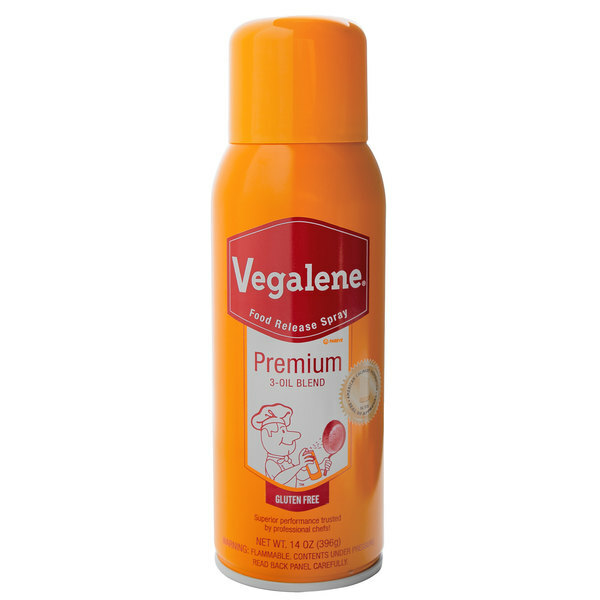 The Vegalene spray is the BEST non stick spray we have ever found. It does not leave the sitcky gunk on the pan after use and the food never sticks. There is no taste and it has a high grade sprayer that does not get clogged. We love this spray! Consistently great results time after time and at a great price too! Highly recommend this amazing spray to all bakers and cooks! We just began using Vegalene and it is superior to any product we have used. It's all oil and no water so you can use much less product. Highly recommended! This is a very good quality spray, I prefer this one over others since it leaves no residue and a small amount goes a long way when cooking. Does not add a taste to any baked good in cake pans or baking sheets and keeps all products from sticking. Very reliable and consistent. We had been struggling with our griddle sticking in the morning after bricking. We researched a bunch of different sprays and chose this product based on positive reviews and good price and we have not been disappointed. I just received this today . I made my families receipe for apple cake. I sprayed the angel food cake pan with this All Purpose Release Spray, and when the cake was done it did not stick to the pan. All I did was spray the entire inside of the pan and add ingredients and bake. Very simple to use and thankful for bought this from WEB.COM . The price is fantastic ,and easy to store in your baking pantry. This spray is my go-to. We use it for our mini bundt cake pans. It releases the cakes easily. I love how this doesn't have a chemical smell unlike other sprays. It is perfect for our needs so we opted to use the hand trigger spray bottles with refill so we can save a bit and less waste. Hands down the best pan spray I have ever used. The secret is the lecithin. It just makes everything release significantly better than the pressurized oil sprays at the grocery store. I stopped at a little diner to have lunch. I'm a big fan of breakfast foods, no matter the time of day. i ordered an omelette. It was fantastic. I asked the Waitress what they used to cook my omelette and she went back the kitchen, I assume to ask the Cook. When she returned she said "vegalene." I had never heard of it before, so I asked her exactly what it was. I don't own a restaurant, but I bought a case and it is now all i use for anything I prepare in my cast iron skillets. It is amazing and absolutely nothing sticks. It takes very little to have a perfect non stick dish. Eggs over easy, piece of cake! High quality product that truly coats the pan when cooking, not like when you use Pam. I can undertsand the somewhat high price since it is such a good quality spray. Excellent baking release for my caramel coffee cake, even in a stainless steel pan. It leaves no residue or weird flavor. A repeat purchase for me! This spray works great. I have used it in every bakery that i have ever worked in and i wouldnt use anything else. It also comes in smaller cans for at home use. I have never in all my years of cooking worked with a cooking spray with better release capabilities then Vegelane. I won't buy anything else. This is amazing - NOTHING sticks! My favorite use is my 9x13 Pyrex baking dish... so much easier to clean now that I use Vegalene when I bake in it! This is really the best pan spray out there!! Good small size makes it easy to have on hand when grilling!! Very good online price!! This all-purpose spray is just that--versatile. It lasts a long time. It works well for us, whether used on the stove-top or used in baking.